Jeffrey Robbins is de laatste dagen flink bezig geweest zijn recent verschenen boek te promoten met youtube-filmpjes. Daarbij líjkt het om een boek te gaan waarin ook flink aandacht aan Spinoza's politieke filosofie wordt gegeven, maar dat is schijn. Eerst het boek, daarna die filmpjes en een tekstje uit het boek, waaruit blijkt dat het daarin niet om Spinozas politieke filosofie gaat. De uitgever: Alexis de Tocqueville once wrote that "the people reign over the American political world like God over the universe," unwittingly casting democracy as the political instantiation of the death of God. According to Jeffrey W. Robbins, Tocqueville's assessment remains an apt observation of modern democratic power, which does not rest with a sovereign authority but operates as a diffuse social force. 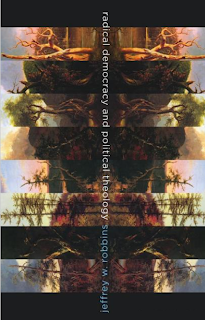 By linking radical democratic theory to a contemporary fascination with political theology, Robbins envisions the modern experience of democracy as a social, cultural, and political force transforming the nature of sovereign power and political authority. Robbins joins his work with Michael Hardt and Antonio Negri's radical conception of "network power," as well as Sheldon Wolin's notion of "fugitive democracy," to fashion a political theology that captures modern democracy's social and cultural torment. This approach has profound implications not only for the nature of contemporary religious belief and practice but also for the reconceptualization of the proper relationship between religion and politics. Challenging the modern, liberal, and secular assumption of a neutral public space, Robbins conceives of a postsecular politics for contemporary society that inextricably links religion to the political."